(Reuters) - Holiday hiring of more than 700,000 workers by U.S. retailers would be the largest since 2014, according to a report by a global outplacement firm, underscoring a robust economy that has seen consumer confidence at its highest in nearly two decades. Retailers have said they would add 704,000 jobs in total to their rosters ahead of the important holiday shopping season, which is up 1.2 percent from the previous best figures in 2014, according to global outplacement and executive coaching firm Challenger, Gray & Christmas Inc in a report released on Wednesday. The firm began tracking holiday hiring data in 2012. Target Corp, Amazon.com Inc and Macy's lead the top retailers in hiring, signaling that sales at their stores would be charged by customers digging deep into their wallets. Overall sales for the holiday season - traditionally between Thanksgiving and Christmas - is expected to rise 4.3 to 4.8 percent to $717.45 billion and $720.89 billion, excluding autos, gasoline and dining out, according to the National Retail Federation. 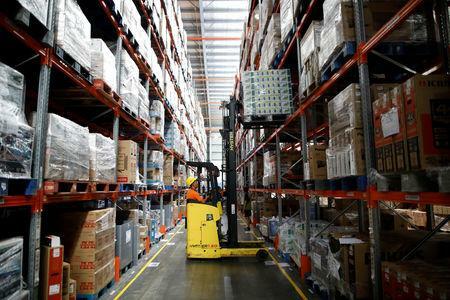 "In a period of near full employment, retailers, logistics firms, transport, and warehousing are competing for talent and upping their employee offerings this holiday season to attract potential workers," said Andrew Challenger, vice president of Challenger, Gray & Christmas Inc.
Target boosted seasonal hires by 20 percent this year to 120,000, while Amazon expects to employ 100,000 workers. Macy's plans to employ 80,000 - the same as last year. Still, finding retail workers is proving to be difficult as unemployment rate hits a 49-year low and workers seek higher paying jobs. This resulted in Amazon announcing recently that it would raise the minimum wage for its U.S. employees to $15 per hour, a first among U.S. corporations. "All of this is good news for American workers, but it is not so good for retailers as some positions may go unfilled and retailers will have to offer more benefits and incentives to get people to work for them," said Neil Saunders, managing director of GlobalData Retail.